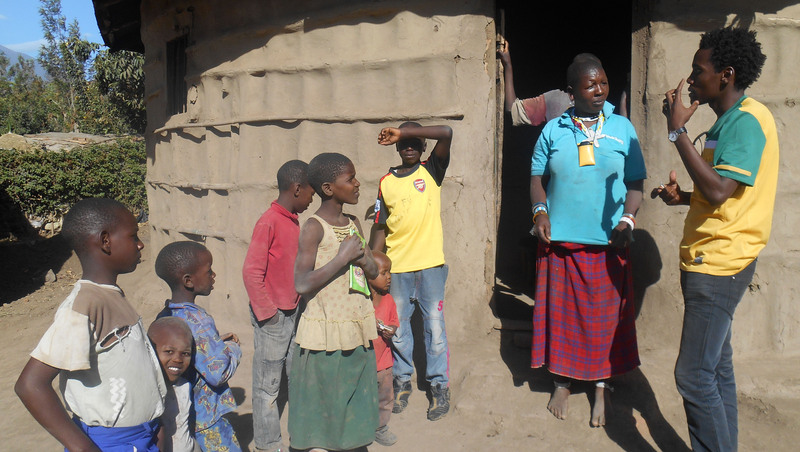 ARUSHA – Hope can be hard to come by for children in Sub-Saharan Africa, but one Tanzanian man has gone back to his profoundly impoverished village to help its kids find and seize opportunities for a better future. Emanuel Saakai, 29, says he’s using sports to motivate and inspire the next generation. He founded ‘Lengo’ Academy one year ago, taking the Swahili word for ‘goal’ to teach the children of Ngaramtoni village to approach their dreams with the same tenacity they use while charging forward on the soccer field. Saakai thinks there’s a lack of appreciation for the power of team sports to work against poverty and bring people together. “A lot of people take these opportunities for granted. For them it’s a normal thing. But when you come to an area where people struggle even to get a pair of shoes, then they will welcome that opportunity with both hands. It’s all about knowing what’s important about that particular thing. If you establish an institute somewhere people don’t need it, it’s like pouring water on dirty land. It’s mud – it’s wasted,” he says. Saakai started Lengo as a passion project. He wanted to provide the boys in his village with opportunities he never had, just to play soccer – Saakai’s parents couldn’t even afford to buy him basic shoes, and they used rolled up clothes for a ball. With the help of his wife Tracey Sawyer and her fundraising contacts in Australia, Lengo has already grown beyond his initial vision, invigorating and involving the entire village in less than a year. He says they’ve become much more active in school and even the very young have begun to take part in community activism. “It’s getting bigger and bigger every day – it’s now beyond my imagination. But I always had the feeling that these boys, these young people, needed such an institute that would develop them. But I didn’t know it would catch on this quick, especially in this area with so many who have nothing,” says Saakai. One of the kids he works with, Amisi, is fifteen years old and living on his own since his mother disappeared. He says he can afford to eat only once every one or two days, and has to walk over two hours to and from school each day. “I feel ashamed to ask for anything, so I work as much as I can to cover basic needs,” he says. Amisi is closer to the rule than the exception for the community that Saakai works with. Akili, sight-challenged boy in Ngaramtoni, sponsored and coached by Saakai. Akili was born with an impairment in his right eye, and has great difficulty playing soccer, which he says is his favourite thing in the world. Saakai has worked to give him special coaching, and now Akili is an important part of the team. Saakai and Sawyer have used their fundraising sources through Lengo to bring Akili to Austria to get eye surgery – they just arrived there last week. “This amazing opportunity… this is going to change his life in general. 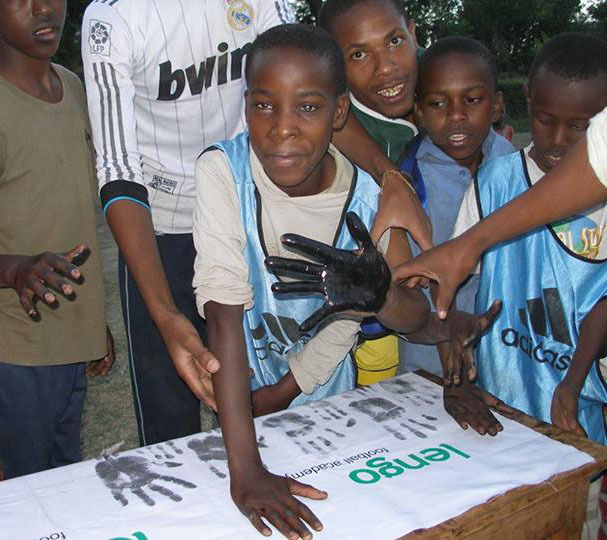 Without these things, without Lengo football academy, then nothing would happen for him,” says Saakai. He believes the Lengo Academy project is about the future more than anything else. He says the children he works with will go forward from Lengo with hopeful, confident attitudes leading them to seize every opportunity in life. “Most of the boys by then will be fathers, with their own families and their own kids. So in that way they’ll be working somewhere as sports people, as teachers, as lawyers and so on,” Saakai says. Saakai and Sawyer recently produced a documentary on Lengo Academy, and are beginning to work collaboratively with other NGOs like Yes! Tanzania to increase positive impacts on community development. They hope Lengo can one day help kids to learn life skills and lift themselves out of poverty across Tanzania, and beyond. Podcast interviewing several prominent members of the Tanzanian media, including Zephania Ubwani, Jonathon Njaidi and Rotlinde Achimpota. It addresses the current state of press freedom in the East African nation, focusing on recent events like the state shutdown of the print outlet Mwananchi, and recent tabled amendments to further discourage reporters from covering matters of political or religious substance. First broadcast for Speak Magazine. The horses have been gone for years, the stable owner and his family are long dead, and the stable itself is barely standing… but Coca-Cola has finally taken the first steps toward a gossamer thread of responsibility for its decades of land-grabbing throughout the developing world. More details can be found via The Guardian here, and a full list of commitments can be found via Oxfam here. Perhaps Coca-Cola’s executive staff was feeling humbled after being surpassed by Apple as the world’s biggest company a month ago. It might be the increasingly problematic association with globally communal iconography like the Olympic rings. Or maybe they feel guilty for the dangerous and grotesque derangement of nutritional logic that is their “A Calorie is a Calorie” campaign. (See here, here, here, or do a google search for more evidence and information). Whatever the impetus, surely Coke’s new strategy of oversight, even if only ostensible, is a great and wondrous thing. Countless millions will be protected from past vulnerabilities. But lets hold onto our commendations for the nonce. that isn’t the sand in the human rights craw. What should bother the conscientious and intellectually honest about Coke’s about-face, is the rigorous pretense of conviction and philanthropy of its new investigative face — which serves to mask what should be a clear and blatant history of malfeasance by the soft drink giant. A history of displacement from traditional lands, sweeping tens of millions over the decades, at an extremely conservative approximation, into derelict refugee camps and desperate poverty. A history of environmental destruction. A history of strong-arming the disadvantaged from accessing our most valuable and guaranteed resource: water, and through its denial, a history of mass-murder. Coke is treating its blood-stained past as a bygone indiscretion, yet its land-grabbing is still as unimpeded as ever.This is an issue of justice. Coke doesn’t deserve to sweep its history, so much blacker than the diabetes-inducing contents of its bottles, under the rug just because they say they’ll stop doing bad things. And we shouldn’t let them.